A ground-breaking salary survey into the expanding Australian Not for Profit sector reveals that a large proportion of Not for Profit salaries and pay rates are not being reviewed on a regular basis. The survey found the lack of remuneration reviews effects employment positions across the sector from CEOs, Human Resources Managers and through to Volunteering Managers, where more than half (58 per cent) reported not receiving a regular review of their pay. The survey, carried out by, Pro Bono Australia and its partners Beveridge Consulting, BT Private Portfolio and Westpac Social Sector banking, found that the greatest proportion of people not receiving regular pay reviews were those in Social Enterprise (53 per cent), Sport and Recreation (53 per cent), Volunteering (52 per cent) and Aboriginal / Indigenous (51 per cent). “Even the better performing sectors in terms of regular pay reviews still had around a quarter of people not receiving a regular review,” Beveridge Consulting Founder Andrew Beveridge said. “In the absence of regular reviews on an annual or biannual basis, there is a risk that individual pay levels do not keep pace with industry and cost-of-living increases. “While pay is rarely the key motivator for those employed in the Not for Profit sector, the lack of regular pay reviews is likely to be a potential source of frustration for many. “Nothing compels an organisation to regularly review pay levels (outside of roles linked to awards), however regular reviews are encouraged as a way of assessing industry and broader salary market movements,” Beveridge said. “These reviews may not always result in increased pay – each organisation needs to weigh up its need to pay (i.e. to attract or retain staff) and its capacity to pay (i.e. what it can afford to pay based on funding streams and broader budgeting),” Andrew Beveridge said. The good news appears to be that CEO pay rates in the Not for Profit sector have risen, particularly in the healthcare sector. In contrast to last year’s survey, Mental Health is now the sector with the highest average total remuneration, across executive jobs from the CEO ($201,992), General Manager and Financial officers, while Arts and Culture ($94,349) and Human Rights ($96,644) has the lowest pay rates. The previous 2013 survey found that the highest average pay rates were in the Health Care/Medical Research sector ($155,951) followed by Foundations/ Philanthropic Organisations ($150,792). The salary survey is one of the largest of its kind and includes responses covering more than 2000 cases across 13 employment positions. “This is indeed a groundbreaking survey into the remuneration offered to those executives and managers who lead this very important sector,” Pro Bono Australia Founder and CEO, Karen Mahlab said. “With over 600,000 organisations operating nationally, more than 1 in 15 Australians work for either a Not for Profit or a charity. “Board members and Executives of all sized Australian Not for Profits will now have access to an extensive and broad-based salary survey to help guide them in their decision making around remuneration,” Mahlab said. 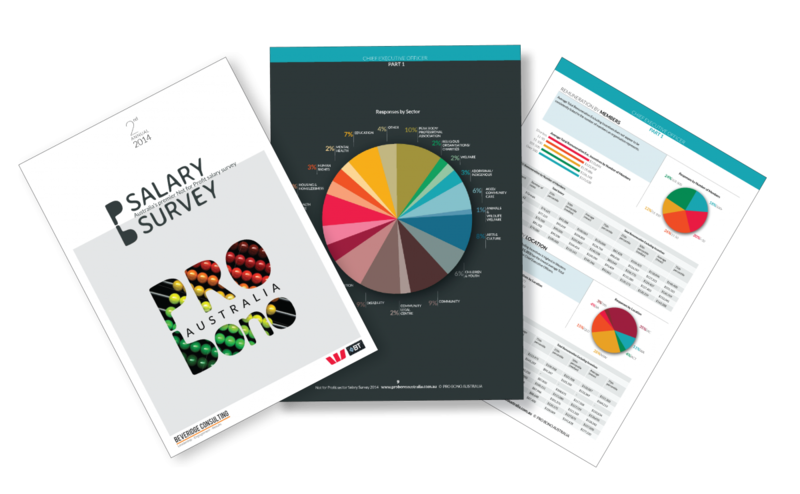 Invitations were sent out in September 2013 by Pro Bono Australia to over 20,000 recipients from small, medium and large organisations to be involved in the Salary Survey. Recipients submitted detailed salary information through a secure online system for roles that were relevant to their organisation. Top pay rates for Not for Profit CEOs are offered in Western Australia ($141,628) while Tasmania ($111,333) has the lowest average pay for Chief Executive Officers. Professional Association ($91,634) have the lowest. Finance managers in education ($126,823) and healthcare ($126,960) organisations receive the highest remuneration. The survey found that for Marketing, fundraising and communications managers the areas of Research / Medical Research ($134,224) and Multidisciplinary ($130,018) are the highest paying sectors . Arts and Culture / Heritage is amongst the lowest paying with an average of $74,891. Canberra (ACT) based roles are the lowest paid in the country. The full survey results are available to purchase here.